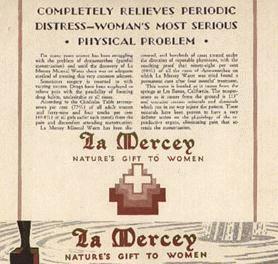 In the 1930's, La Mercey Mineral Water, "Nature's Great Gift to Women," was marketed as a permanent cure for dysmenorrhea. The target audience was the majority of women (said to suffer from menstrual pain) and especially "tired and haggard women" and women undergoing menopause. Tired and haggard women were included for "experience teaches that tired and haggard women are generally avoided. One of the greatest causes of that worn and tired expression and actual fatigue is dysmenorrhea. With the elimination of pain at the menstrual period the freshness and care-free appearance of youth returns..."
La Mercey water was bottled as it came from the ground at 113 ° at Los Banos, California. La Mercey sold for $1.25 per quart with 4 quarts recommended per month. Success was promised in 4-6 months. Women who wanted immediate treatment were advised to bypass their druggist and order directly from La Mercey. Graphics and excerpts from La Mercey sales pamphlet, date stamped May 19, 1931, from American Medical Association's Historical Health Fraud & Alternative Medicine Collection. See also, FOUR EPOCHS OF WOMAN'S LIFE: A Study in Hygiene by Anna M. Galbraith, M.D., 1901, rev. 1915 (e-book, hypertext) and the Museum of Menstruation.